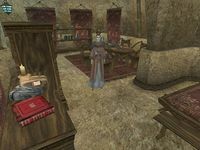 The St. Olms Waist North-Two is the residence of Favona Gilnith located outside on the northern side of the Waistworks level of the St. Olms canton in Vivec. 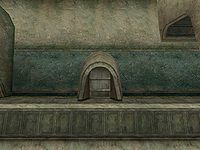 Along the eastern wall is a set of shelves, with three sacks containing random ingredients and cheap food on the bottom-most one. Nearby is cloth sack containing five gold, random expensive clothing, and two pairs of common shoes. In the southwestern corner is Favona's bed, beside which lies a bottle of sujamma. Opposite the bed is an empty dresser, on top of which rests a copy of the Speechcraft skill book Biography of the Wolf Queen, along with an expensive shirt and a matching skirt. Next to dresser is closet with random expensive clothing, as well as two baskets that have a slight chance of containing special or marksman loot.